​Today is our last day in Kondoa. 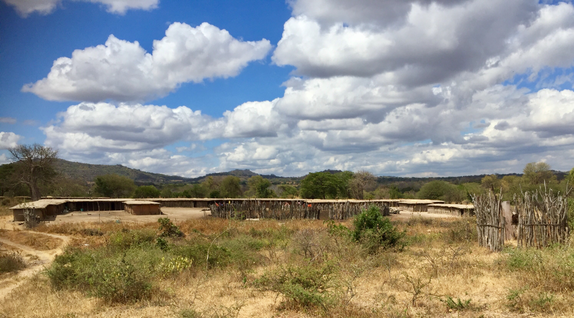 Each day has been rich in new experiences even though we have been to Tanzania four times before. On our way to the last village, the road was blocked half way along by a donkey which had sunk to the ground under the weight of 3 large buckets of water. No amount of prodding, pulling or whacking could make it get up. We thought it must have something seriously wrong with it. We had never seen a donkey like that before. They usually trot along willingly. At last, one of the men accompanying us, John Bei, got out of the Land Cruiser and prayed, "Lord, if this hold-up is from you please tell us what the significance is. ( He was thinking of Balaam and the donkey) But if it is not, please help the donkey to get up." Immediately, the donkey sprang up, the water was loaded back on and it trotted away briskly. Wonders will never cease . So we got to the last village, Birise. It was the Bishop's first time there as well as ours. It is a year-old church with about 280 members. Yes, you have read that correctly! ...Helen had a great time teaching healing prayer with John Bei translating. 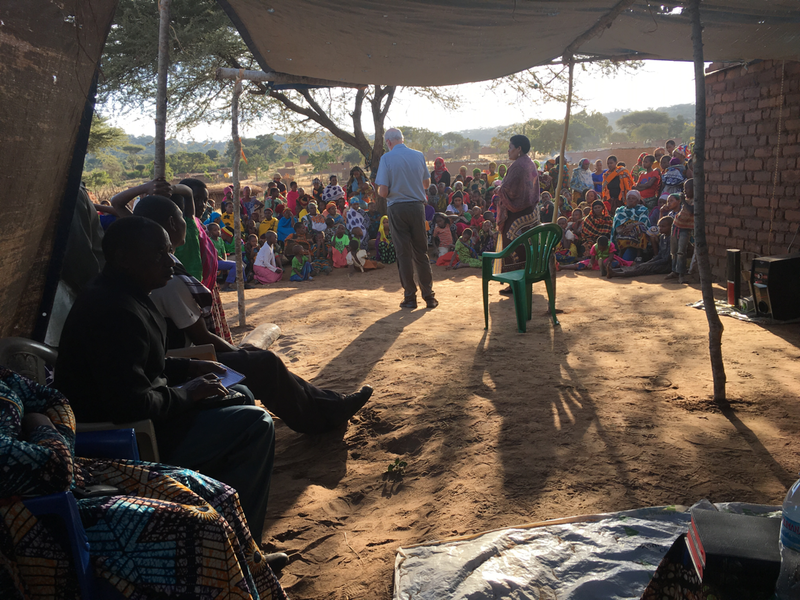 So our goal of empowering the villagers to heal the sick has been achieved but there was a bonus: Revd John Bei grew in confidence as we travelled and now has confidence to teach and run seminars on this subject himself. What a big step. We are so pleased to be working ourselves out of a job. The verse that Ian and I are meditating on these past few days is "The fields are ready to harvest. Pray to the Lord of the harvest to send workers into the harvest fields." Jesus said this in the context of sending disciples out to heal the sick. So we are privileged to have been sent out and used to train and equip workers to bring in the harvest. Praise God! I am perched on the bed, back at base after three days in a remote village called Nante. I am trying to tuck the warm blanket around my legs in such a way as to fool any stray mozzies into ignoring me. Being the cold, dry season, there are few around but I think I have had my first bite of the trip. I am thankful that the hornet that flew out of the long-drop as I approached it yesterday was not angry! I wouldn't choose that kind of bite over a mozzie bite. Four members of the team have suffered diarrhoea and three, vomiting as well. Two had really bad colds but I'm glad it wasn't a full team count on both! On the way we saw a huge 'boma' - a traditional house - that man would have many wives, see below. The church here is only one year old, the people converting from the local traditional African religion. For our visit they erected a shelter made of sticks and tarpaulins for the meetings. The first day in Nante, I prayed for a woman who had a congenital cataract on the right, by the looks of it. A white patch covered the iris and the pupil. The other eye was fine. Her bad eye ended up being able to see far and near. Also, her headache went. The next day she helped me pray with Ian and John Qubei for a man called Samuel who has been totally blind from birth; three local people testified to that fact. He had been led to the meeting by another young man called Ezekiel. On our second prayer attempt, Samuel said to John (who was translating) that he could see his face. After the next prayer he was able to count Ian's fingers correctly four times. Then we tested him with identifying colours - which he got right. When the teaching time came he was able to tell how many fingers I held up from about 8 metres away. Very exciting! There was huge rejoicing in the congregation. Yesterday, Bishop Given got news at 6am that his mother is seriously ill in hospital. Please pray for her well-being. First, his wife Lillian took the 9-hour bus ride your Dodoma to be with her. This took a competent translator and pray-er from the team. Now this morning our time in Kikore is cut short because we need to take Bishop Given home to be with his mother. 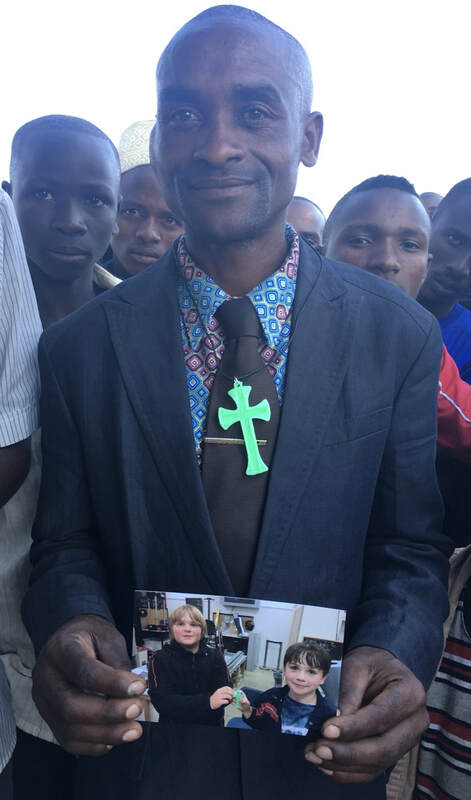 Please pray for him on the long journey home to Dodoma. While he travels, part of our team will see what they can do to help the people of Chemba get their amazing windmill water pump going. This is vital for the success of the youth vocational centre which is being built there at great cost. 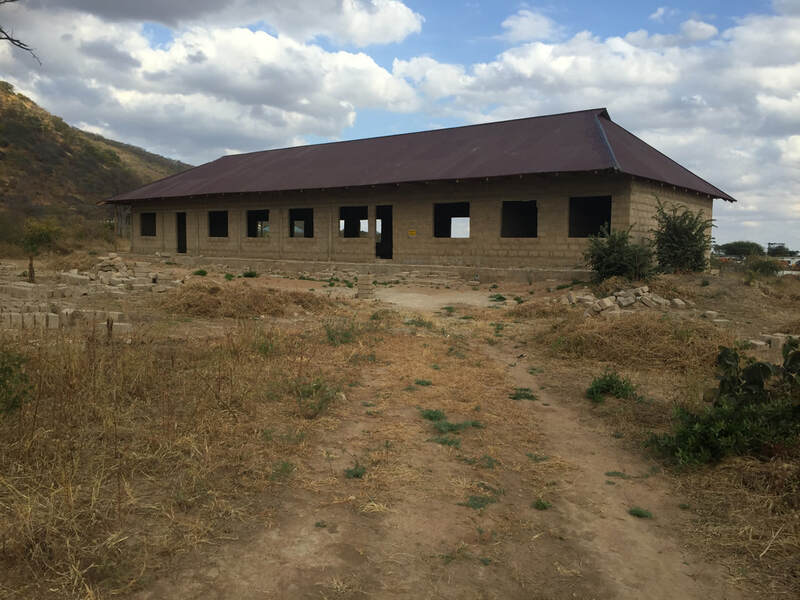 The main buildings are completed but unfinished due to waiting for funds to come in for furnishing them and painting them. Everything here is impossible, except for God's intervention and the generosity of donors. It is dry, dry, dust all around - apart from water fetched in buckets from kilometers away. How can they better themselves with nothing to start with? The vocational centre will provide education for young people who would otherwise stop attending school at about 13 years old. Bishop Given has a vision to see education provided for up to 600 students at a time. This is impossible- but, God will provide, he is sure. How else could they have gotten this far? They have purchased land very close by, that will be used for a model farm to teach new farming and irrigation methods. There will be training for carpentry, plumbing and other vital skills. We spoke to the current Bible School principal in Kondoa. His wife had waited a day and a half from the time the plumber promised to come. Then she went out briefly and during that time, he arrived and "fixed" the gushing water meter with... a piece of screwed up plastic bag! Needless to say it was not fixed at all. And the meter continued to record litres of water supplied that they were not getting any use from, being spilled around the meter itself but they would still be charged for it. Training in plumbing is very much needed. Thanks so much for your prayers which help make this trip possible and successful. Today we travelled to Kikore which is a village we had visited in 2014. 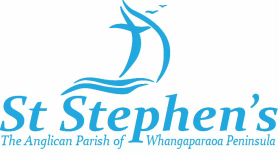 It is also the village where the Rev John Bei (who visited Whangaparaoa in November 2017) grew up and we met his mother, brother and cousin. The steep, rocky road we used last time is now completely impassable because of winter flooding, so we had to go the long way around. Fortunately the Chinese-built tarmac road is very smooth and has taken a lot of time from the overall length of the trip. Unfortunately, the Chinese presence in the country has opened up a problem in that they are buying many donkeys to send to China to be eaten. Now the donkey population of Tanzania is 30% of what it was a few years ago. The government has not yet placed any protection on donkeys so the significant place they hold in agriculture, haulage of water and transport is in danger. I had a conversation with Lilian Gaula on the way to the guest house we are staying in tonight. 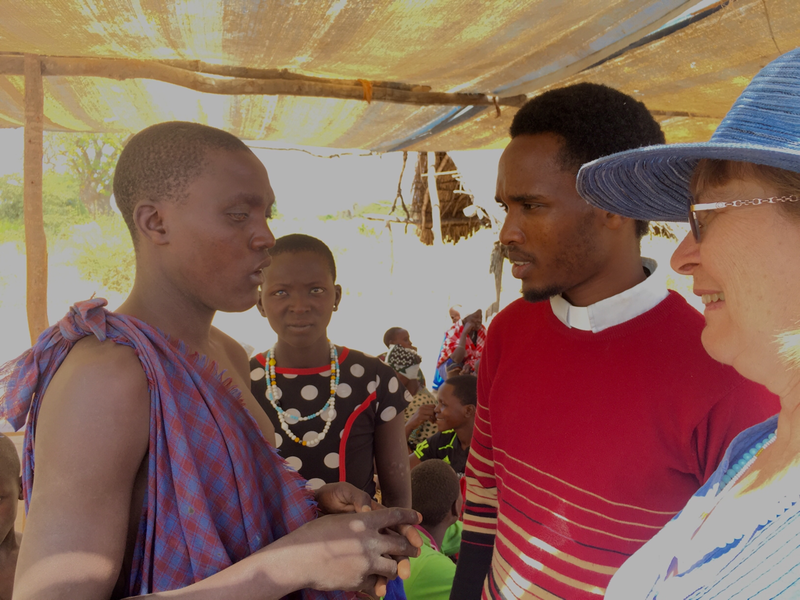 She says that despite the years of basic education and then theological education and ordination training she has received, she still did not know how to deal with curses until we came to Tanzania to help them. Curses are very common here, so this practical teaching has been very important in her pastoral care practice. Also, Bishop Given told Ian that when we come with our teams, there is significant subsequent growth in the parishes we visit. ​How encouraging! ...Today Ian taught on how to receive forgiveness for sin and how to forgive those who have hurt us this gaining freedom from bitterness and the knock-on health problems which seem to follow our harbouring a chronic, unforgiving attitude. Tomorrow and Saturday we return to Kikore for further teaching sessions then go back to attend the Sunday Cathedral morning service. Some of the team from Whangaparaoa and Rangiora next to Lilian Gaula: Ian, Andrew Allan-Johns, John Mock, Diane Carss. Yesterday we returned from the first visit to a village. We were amazed to find about 250 people there to greet us. They came from Chiori and the surrounding area. Bishop Given had never been there before and neither had the driver! The tortuous road took 3 and 3/4 hours to bump over getting there, so at 2pm we were hours later than expected. We had a dry bun and some cubes of goats' liver for "morning tea" and straight after (because of the delayed arrival) a lunch of rice and goat stew. The gathering included enthusiastic dancing and singing by the youth and children's choir. Revd Andrew started off by saying "Bring out those who are blind.". No pressure then . So we prayed for all who came up. One woman I prayed for had floaters in her eyes which disappeared and she was very happy. Another wanted prayer for her eyes plus heaviness felt in her head and shoulders. All was well at the end of a short time. Such a remote village has little access to modern hospital care, so they were not just wanting to please us when they said they were better. Several waited a long time for prayer and did not go away quickly. One was prayed for in English for healing of cataracts, and poor focus and any other eye disease. She indicated that she was still not healed so Ian fetched an interpreter. He learned that she had been riding a motorcycle and a stone had flicked up into her eye causing ongoing pain. He commanded that the pain go away and before any translation had happened, she smiled and said it was better. The pain had gone. Praise God! Ian preached that forgiveness for sin is available ftom Jesus. (Photo above with Lilian, the Bishop’s wife translating.) About 18 responded. Please pray for the children who were coming forward to respond to the altar call and were pushed back to their seats by a woman who may have thought that they did not understand or were too young. Must start getting ready to go! Everything takes longer here. Boil water for warmth washing. Find suitable clothes. Pack for overnight stay at Kikore. Walk up to Bishop's house. Wait for breakfast. Eat. Pray as a team. Time to go!! Now we go today to Kikore, way up North, where we have been once before years ago. Please pray that God would go before us and that we would be sensitive to His voice as we preach and minister. St Stephen’s 3D Printing Club designed and made some gifts to take to Africa. 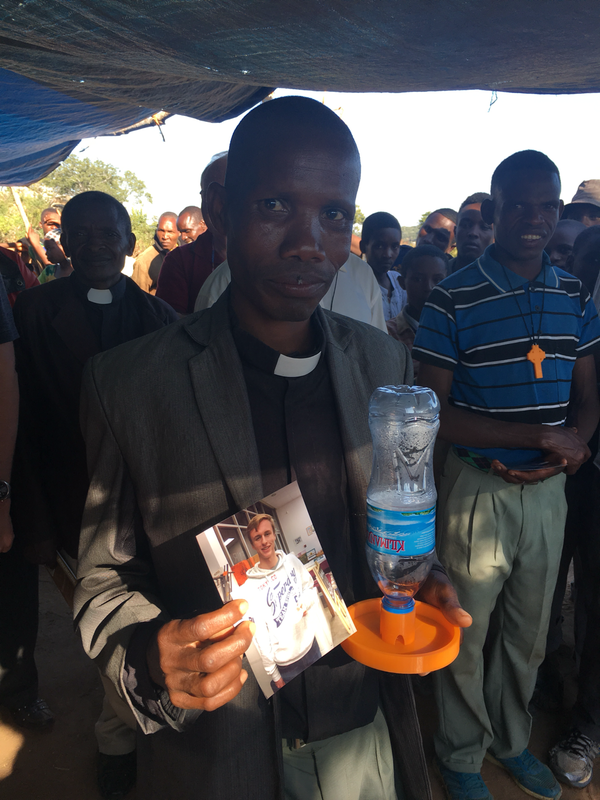 I gave 4 crosses to the Catechists at Chiori parish and a chicken water dispenser to the pastor. They were very excited and there was much cheering at the presentations. 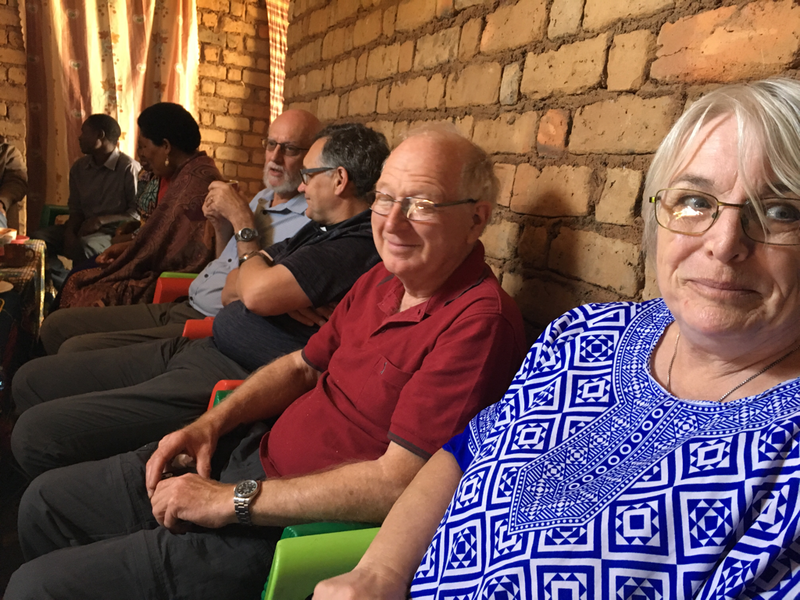 Ian, Helen and Diane travelled to Kondoa to continue the training around the Deaneries of the Diocese.